shine brite zamorano: it's a block party! This year’s annual 1st week “almost whole school” collaborative is up in the auditorium. All our 2nd thru 5th grade classes contributed to the success of this large scale public art installation in our auditorium. I’m going to keep this short and simple because I plan on writing it up more in detail soon for an upcoming Arts & Activities piece as part of my “Alive and Kicking” article series that focuses on using contemporary art as inspiration for your visual art curriculum. 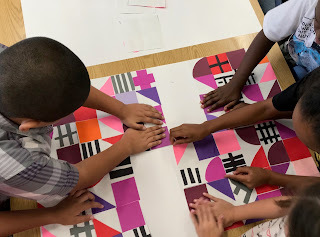 The inspiration for this activity was a block party” quilt by Corinne Sovey- a graphic designer and quiltmaker based in Austin, Texas. 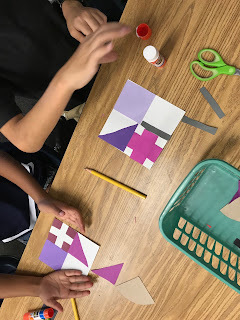 With this activity, my students had about 20 minutes to design a quilt square that used the geometric elements found in Corinne’s quilt- with the addition of one more as well. After briefly going over my class rules and regs, I introduce the quilt and we identify the shapes in it. After that, we get busy making. 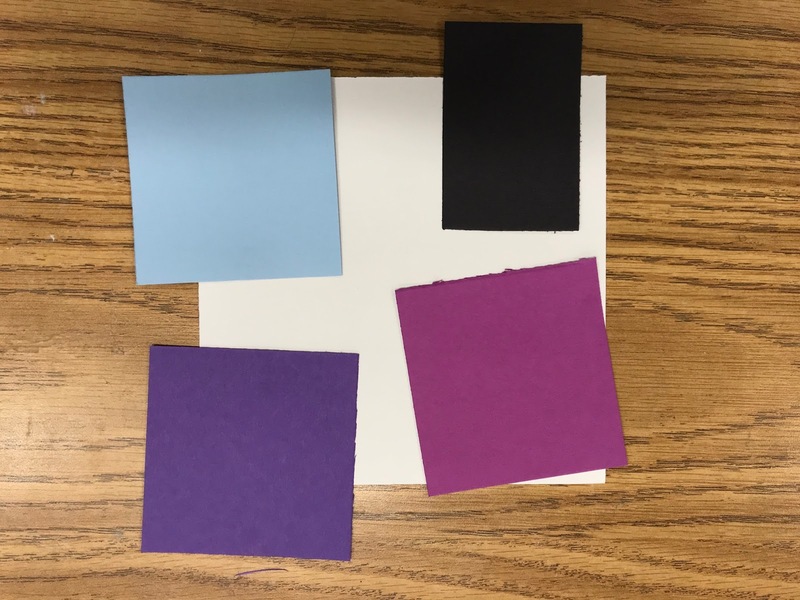 Each student starts with a 6x6 white square, 3 analogous color 3x3 squares, and a black or dark grey 2x3 rectangle. 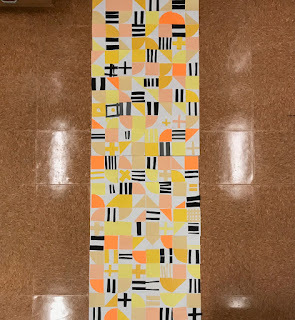 As classes roll through, the colors that are out for them gradually transitions- I usually start with yellows and move thru the spectrum until we end up back at yellow. I had plans for something a little different this year, but it didn’t happen;) The activity provides some student decision making opportunities while also working within certain design constraints. 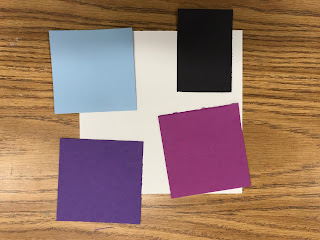 4- with the remaining colored square, students have a choice- they may use a cardboard stencil to turn it into a quarter circle or they may cut it into rectangles. 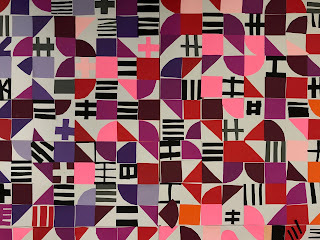 They take the shape or shapes and place in another white quarter. Again, experimenting with rotation and if using rectangles, they should only use them vertically or horizontally. 5- the final black rectangle is cut into a minimum of 2 rectangles and placed in the last white quarter. Again, attempting to limit themselves to vertical and horizontal positioning. 6- once they have all their parts, I encourage them to look at their arrangement and decide whether it is satisfying. If they need to move pieces, they may. 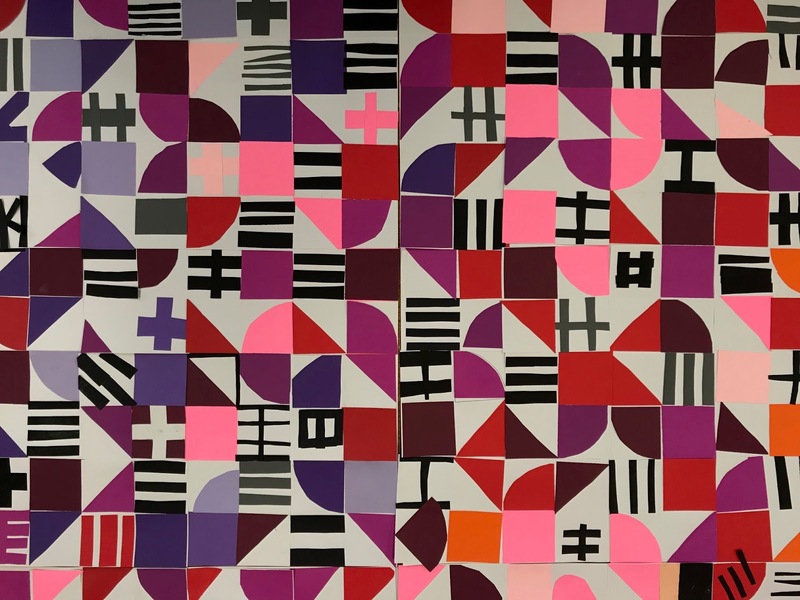 9- students place and press their quilt squares on a large 24x36 white sheet of paper. I encourage them to look at the placement of the other student pieces and respond to it. 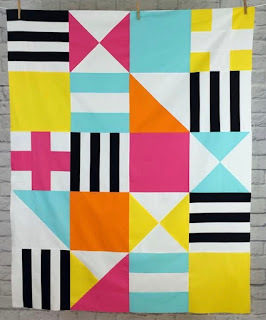 They may decide the bottom of their design looks better at the top, or they might want to rotate it a quarter turn to join in a more interesting way with another quilt square. 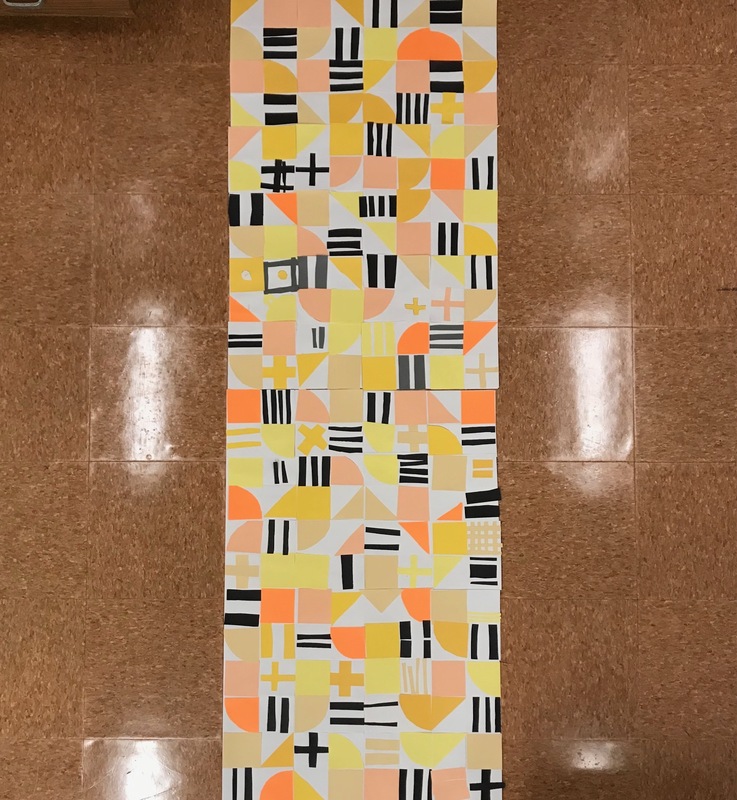 As classes roll thru, I place the working collaborative on my floor, so students can start to get an idea of the overall effect and color transition. And boom! So many kids have work on display and the install celebrates the elements of unity and variety as well as the community and diversity of our elementary school. This is so gorgeous! I hope you do not mind that we are replicating your lesson here in South Portland, Maine and connecting it to International Peace Day. 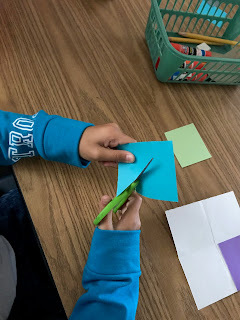 We are reading poems from the book Peaceful Pieces before planning out our individual collaged "quilt" squares. I would love to give you credit on Instagram and Twitter. What name should I use? Thank you! I love this so much. I think I might give this a go as well. I'm a new art teacher, and I'm looking for an all grades project for the first few weeks of the semester. I'm an Itinerant art teacher, so I need a Wow project, for them to remember me too. LOL..I will give you credit of course! I usually post on FB, but I will most like start an Instagram thread for my upcoming projects. I can also share here if you like. thank you for sharing your amazing projects with the kids, they are very lucky. Oh my goodness! This is gorgeous. I have to spread this post like fire. It is mind blowing. My nephew’s birthday is around the corner and I have booked a nice venue NYC for his birthday celebration. I must add such amazing activities to the day.